The end of the year brings no greater joy than the opportunity to send you our warmest wishes for the holidays. We appreciate your business and look forward to working with you in the New Year. This time of year, I often get asked about what we see for the coming year. As we look ahead to 2017, we see a number of trends in laser scanning. Laser scanners and software will continue to improve. The new Leica Autodesk BLK360 Scanner with thermal imaging is small and lightweight, adding to niche-scanning capabilities. Software improvements and new software will increase automation and the speed of utilizing scan data. Laser scanning for Engineers will continue to grow at an accelerated rate as more and more firms are repeat users of the technology and are starting to understand its place in their workflow. Firms will find more technical and specific uses for laser scan technology. General Contractors have embraced the technology and probably have the most to gain from laser scanning. Progress scanning will continue to grow in this industry to uncover potential issues long before they become a costly problem. Drones will continue to grow in popularity, but still won't play an integral part of laser scanning yet… however, photogrammetry will assist in the overall AEC field. We'll see more kinetic scanning for interior applications, but most likely not in 2017 as the accuracy isn't quite there yet. Applications outside the mainstream are utilizing laser scan technology in ways most of us never imagine, such as forest ecology and studying earthquakes and landslides. How can we help you in 2017? Laser scanning is our passion and you are our priority. Call us today at 419-843-SCAN (7226) or email us at info@truepointscanning.com. 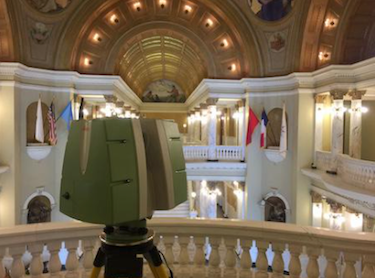 TruePoint provided 3D laser scanning services for the South Dakota State Capitol Building. Completed in 1910, this architectural and historic landmark has a central rotunda flanked by legislative wings. The client wanted to capture the as-built conditions to document the architectural detail and historic art for restoration or should a natural disaster occur.